We need to have you over for steak. Matt’s favorite is fillet too and he cooks it perfect every time, but on the grill. Both the girls eat an adult sized portion. We just had it this weekend and man it was good! Yum, steak. Of course in Europe that would be way overdone 🙂 We had them nearly crawling off the plate in an amazing restaurant in Switzerland, and the french guys said they were still too cooked. Never heard of this way – my parents would always broil them in the oven, sounds good, though. I’m usually disappointed on how my steaks end up, so I’m definitely going to try this. Thanks for the tip! hopefully this trick will work for you – it worked for us! yum! I have a friend who has a phd in meat science (and yes she went to work for a petfood company with that degree but I digress…) She says that if people ate their steaks, and could not see them, that EVERYONE would eat their steaks rare!!! So much more flavor and tenderness. I still need medium rare but I’m thinkin she is probably right…. I ususally just broil or just pan sear, this method is very interesting, must try next time I crave a steak. Oh I LOVE steak. Since we have nice weather pretty much all year, we grill all the time, but this is great for those times when….the tank runs out 🙂 oh yes that happens even when you have two tanks trust me. This is so interesting! We don’t eat a lot of expensive red meat (we eat a lot of ground beef or roast) but when we do I’m so nervous I’m going to mess it up and waste all that money. I can’t wait to try this next time we’re in the mood for steak. Wow this is awesome! Thanks so much for posting! I pinned it on pinterest to come back to later! this is a keeper! 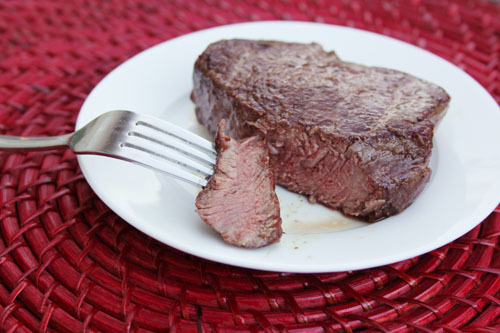 The absolute BEST thing you can do for ANY steak is to cook it at room temperature. It’s the holy grail variable of steak cooking. I haven’t eaten meat in years (except for that bratwurst at october fest last year 🙂 ) and this post just makes me want to get a medium rare steak. enjoy! I am so glad you commented…because I”m glad it was amazing AND…people keep commenting and pinning saying “this is a great idea for when I can’t use the grill” but like you said, I’ll never use the grill again! this just comes out SO WELL. anyway, glad I could convert you! 😉 happy valentine’s day! Hillary posted about her success with this recipe on facebook, so I made it this weekend for a belated birthday dinner for my husband. You’re both right, the filets were a perfect medium rare with that awesome caramelized outside – I’m also fully converted and won’t go back to grilling! This totally did the trick. Even though the cut of steak was on the cheaper side, it made for a delicious dinner! Thank you! OMG – that was totally incredible. We are people that for the past 25 years believed the only way to cook was on our gas Weber. But admittedly were never totally happy with how the filets came out. So I tried your method tonight and I have to say I was skeptical. First of all, baking and not grilling? And second, searing after cooking went against everything I had previously learned. But we followed your directions. For two 8oz. filets it took about 25 minutes to get to 91 degrees. Then I seared on both sides for two minutes each in a cast iron skillet. I wanted to use butter but instead I followed your directions and used vegetable oil. I seared the (sort of) three sides for about a minute a piece. It was absolutely the best steak I have ever, ever had! We had been considering going to Capital Grille tonight. I am so glad we decided not to as this total meal cost as much as one steak there ($45) and was so, so, so much better. You made our weekend. Of course it’s important to start with a good steak and in our area there is nothing better than Butcher Boy, but the steak alone is not enough. It took your recipe to bring it to perfection. Thank you so much! Sorry – I meant to say I seared the (sort of) three edges for about a minute a piece after searing both sides for two minutes each. The crust was superb! Thanks! marc, I am SO glad you commented! I hope everyone who reads this post and is skeptical like you were will read your comment. I was skeptical myself when my MIL first told me this technique, but you’re right, it’s seriously PERFECT. anyway, your comment made me smile and I’m so glad it worked well for you, too! thank you! I am making this recipe for the third time. I avoided steak in the past because I could never cook it properly, but this recipe is the way to go! Love it! I just LOVE hearing that! woohoo! I have to comment on this again. As Kristen above, we just made this for the third time. It is SO amazing. I had no idea steak could be this perfect at home. The grill just can’t compete. Waldo, if you’re still wondering–yes, you can certainly finish this or any steak on a Weber, but you need to be careful. The grill is likely to be MUCH hotter (450+ degrees) than even a cast iron pan. But it can be done, and I have. Ok. First get the coals ready so they are *in the grill* as you put the steak into the oven. When you remove the steak, the grill coals should’ve burned down some and ideally will be a little cooler. If you have a Thermopen (if not, get one…very expensive but easily the best kitchen money I ever spent), use it to test the grill’s radiant temperature. You want it to be around 350 or so. Now sear the steak…if it’s hotter than that, I’d cut sear time to 90 seconds on each side, 45-50 seconds each edge (don’t forget the edges). Keep a beer or water handy to douse any flareups. Remember, the most important grill tool is a WATCH. Time it exactly and you will be very happy, especially if you just dropped $40 on good meat. This will err on the rare side, as one should 🙂 but that’s safer, as you can always give it a minute more if necessary. But it should be perfect as is. And make a quick note like an email to yourself about the time it took. Webers are awesome, but vary tremendously based on humidity, outside temperature, and wind. Good luck. great tips, vanveen! thank you! I’ve always done it the reverse method, sear then oven. This was just interesting enough to give it a shot tonight. Used two bone in NY strips, brought to room temperature for about 25 minutes while the oven was heating up. Brushed lightly with grapeseed oil (high smoke point) then applied coarse cracked salt and liberally with coarse cracked pepper. In to the oven until they reached 90 degrees. Had a cast iron pan on the stove on medium high waiting for the steaks. Dropped the steaks in the cast iron and immediately added a nob of butter and some rosemary sprigs. Brushed the steaks with the rosemary and spooned the butter over the steaks as they cooked for two minutes a side. After the two minute searing, I pulled and tented the steaks for about 10 minutes. I can’t wait for warmer weather to try and take them from oven to lump charcoal for the last few minutes. Thank you so much. This was a winner! I am SO happy that you tried the method! everyone I know has done it the reverse and when I describe this they look at me like I have lobsters crawling out of my ears. 😉 it is just so much more reliable! anyway, so glad you commented and I’m very happy it worked for you! This is foolproof! We love it. Tonight did a thick porterhouse and it was fabulous. Finished in cast iron pan because our grill still has a mountain of snow on it, but often finish the steak on a hot grill. thanks for commenting – so glad it was perfect! Thanks for publishing this. I had heard an interview with the folks from Cooks Illustrated and wrote this down but lost it!! Just finished making for my husband with a ribeye. I picked up the steak from my butcher about 2 hours before cooking it (happens to be the best butcher outside of NYC), so it sat on the counter and got to room temp. Because he likes his steak rare, I put in the oven for only 10 minutes. My thermometer is untrustworthy so I just guessed at how long I should keep in there, but it turned out to be the perfect amount of time. The only thing I did differently was add a pat of butter to the cast iron frying pan. My husband’s review: EXQUISITE!! 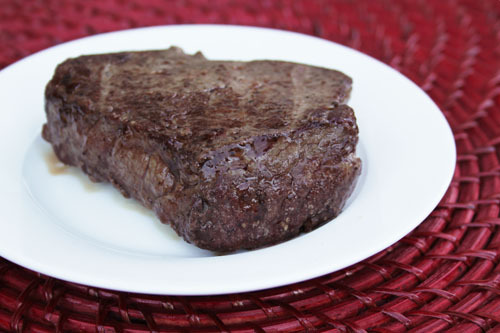 so glad you could track the recipe down here – it really is the best way to cook steak! I think your modification sounds marvelous, by the way! yum! America’s Test Kitchen has studied how to cook steak to get the charcoal sear and flavor, and the result is published in the current issue of Cook’s Illustrated. Briefly, they cooked it first in the oven, skewered the steaks with 2 skewers, and placed the steaks over the charcoal which was still in the chimney. Brilliant. They even tested various chimneys. (They liked the 7 inch diameter Weber chimney.) Everyone should subscribe to Cook’s Illustrated. Now if they would only make their web site user friendly. and, yes, if everyone read Cook’s Illustrated everyone would be able to cook – something our society needs more of! and, yes, 100% agreed about the website! This steak was the best I have had from an oven. I marinated it in balsamic and olive I and the cook times were perfectly accurate. thanks! sounds amazing! and glad the cooking times worked perfectly for you – yay! This is a great method and easy. I like to call it 5 minute steak. We marinated a few NY steaks over night. We tried two steaks broiled and two in a cast iron skillet. The skillet to oven method produced a perfect medium rare steak with nice seared crispy exterior. The appearance of the broiled steaks were boring. Thanks for sharing the recipe. thanks. I live in Nepal and it is impossible to get a decent steak as the only beef here is from India where it seems they wait until the cows die of old age before they butcher them, the “tender loin” is so tough. The closest thing to the taste of steak that I can get here is ostrich meat so I tried your recipe on ostrich meat. It worked quite well. The only variation to the preparation was I used black pepper instead of normal pepper. Now if I can do it anyone can as I am definitely not a chef nor am I a half decent cook. thank you so much for commenting, so interesting!! and good to know this works for ostrich, too! 😉 thanks again, so fun to hear your story! This is the only way we want our steaks now! It’s gotten to the point where we don’t even order steak out because mine are just as good, if not better than the restaurants! Everyone I tell about this seems skeptical but I’ve made these a couple times for friends on NYE (used a griddle for the searing multiple steaks) and they’re all believers now! Thank you for providing this recipe, I recently saw it on an ATK rerun and couldn’t remember everything, and of course I hadn’t written anything down. I made eight filet mignon steaks last night for a family dinner with my grown son’s and their wives, and they came out PERFECT! I was a little worried when they came out of the oven because they looked so weird, but after searing on my stovetop grill pan they had beautiful grill marks and the inside was cooked to an even perfection. I will be using this method every time I make filet mignon. Thank you so much. Absolute perfection. Yay! Love hearing that! You’re welcome! Ever since reading about this in Cook’s Illustrated a few years ago this is the only way I cook my steaks anymore. It is amazing how well it works. Perfect crust, no tough grey layer, just freakin awesome! Thanks for posting this, I couldn’t find my Cooks Illustrated magazine and their website requires you to sign up to view the recipe. You’re welcome! I am so glad I posted this, too…it really is the best way and I come back to this post every time we make steak! 😉 Happy cooking!